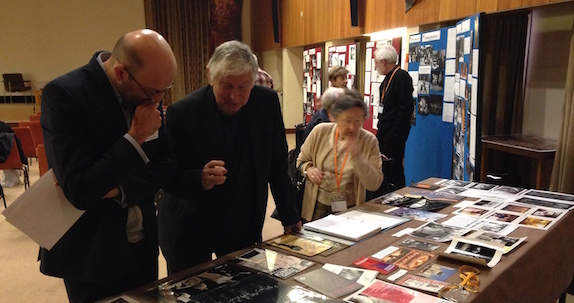 The Shakespeare Birthplace Trust (SBT) holds the archive of the acclaimed theatre director Michael Bogdanov. The collection (reference GL22) consists of over 2 cubic metres of Bogdanov’s personal papers from the period 1965-2010. It is a testimony to Welsh, English, Irish and European cultural development. The team is working hard to ensure that this collection is fully utilised in supporting research into how Shakespeare and theatre generally can be harnessed for contemporary political needs – in keeping with Bogdanov’s own aspirations for the collection he entrusted to us. Michael Bogdanov was born in Wales in 1938 and was educated in London, Dublin and on the continent. He worked for the BBC and the Irish broadcaster RTE. Bogdanov’s theatrical career included work at the Royal Shakespeare Company, the National Theatre, the Abbey Theatre, Dublin and the Deutsches SchauSpielHaus, Hamburg. He cofounded the English Shakespeare Company and was involved with the Wales Theatre Company. Bogdanov pushed boundaries: in theatre production, in politics, in court. All of this is reflected in the collection and SBT is embarking on a multi-strand approach to bring GL22 to wider attention. As a significant first step, Dr Darren Freebury-Jones will join us as ‘Louis Marder Shakespeare Centre Scholar’ for 2018. Through research into GL22 and relevant other collections e.g. Royal Shakespeare Company productions associated with him, Freebury-Jones will highlight how study of Bogdanov can stimulate and inspire new understandings and presentations of Shakespeare’s work. SBT is also scoping how best to develop and strengthen existing finding aids, to facilitate better access for specialist and general researchers. In keeping with Bogdanov’s commitment to making cultural work available and relevant to all, SBT will also explore how to bring the collection to wider audiences. A good starting point is Bogdanov’s strong Irish dimension, reflected in the archive and which will be highlighted out through a free, public research conversation, supported by blog articles etc. to coincide with St Patrick’s celebrations in March 2018. This model will also be considered for showcasing other international aspects of GL22. Michael Bogdanov died in April 2017. Colleagues fortunate enough to have known him all refer to his natural warmth and essential humanity. It is clear from written sources that Bogdanov cared passionately about people and how theatre could influence their society. SBT is exploring funding options to ensure that the collection becomes an accessible resource for all who wish to understand more about the life and legacy of a remarkable man. A summary of GL22 is available online.